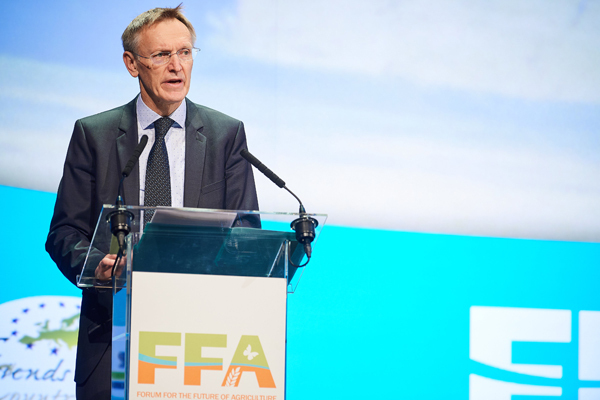 Janez Potočnik, the Chair FFA2018 and Chairman of the RISE Foundation, delivered a stark warning to the packed room at the 11th Forum for the Future of Agriculture. “We are sleepwalking into a potential catastrophe of our own making,” he said as he opened the day-long conference on the theme, Healthy farming, healthy food, healthy future. That catastrophe is being caused by climate change, ecosystem destruction and a misalignment between our economic and environmental goals. Failure to act now, would see not a sudden collapse in our climate and ecosystems, he explained, but a gradual failure, and “by the time our population truly sees the consequences … it will be unfortunately too late”. Mr Potočnik acknowledged that measures are being taken to redress the harmful effects of human activity, ranging from biodiversity loss to pollution, but these only treat the symptoms, not cure the illness. A more fundamental response is essential. “We must fully take into financial account the negative environmental consequences of our consumption, re-value the hard work of most people and stop the obsession with stock prices and quarterly growth,” he stressed. The radical change Mr Potočnik set out requires what he termed “systemic leadership” to succeed. He challenged participants at Europe’s largest annual agricultural conference to play their full role. “When I look at you, I see a critical mass of stakeholders from all areas of private and public life capable of moving mountains – of completely transforming our food systems. When it comes to the SDGs (Sustainable Development Goals), climate change and the big challenges, I believe that everyone here can, and should lead,” he told them. Those efforts are not limited to the European Union. They should include empowering people, especially women and girls, in developing countries – a theme to which Her Majesty Queen Noor of Jordan devoted her special address. Drawing the forum to a close at the end of the day, Mr Potočnik repeated his call for a leadership that would “rewrite the rules of our economic models, farms and environment”. This will result in enormous shifts in capital, politics and power. Some will lose from the changes, but they must be implemented since “as a society, we will not just gain a healthy future, but any kind of future at all,” he said. The Chair FFA2018 offered concrete proposals that would define systemic leadership. These include implementation of all 17 SDGs, a readiness to adjust policies to changing circumstances, involvement of all levels of governance and stakeholders and a willingness by individuals to take the lead in their own particular activity. In addition, he identified the European Union as the “best pilot for this new global governance”. The suggestion chimed with a clarion call earlier from Louise O. Fresco. The President of the Executive Board, Wageningen University & Research had called for the EU to take the lead in establishing an intergovernmental panel on food and agriculture, similar to the UN’s Intergovernmental Panel on Climate Change.